Quick overview Wireless mouse delivers the perfect mix of performance and precision with a micro-precise scroll wheel; comfortable, compact shape and three full years of battery life. Innovative, micro-precise wheel packs more grooves per millimeter for the ultimate navigation experience and makes scrolling through long web pages faster and easier. Plus, the built-in tilt wheel lets you move backward and forward on the Web. 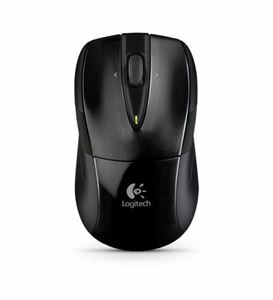 Advanced optical tracking delivers laser-grade precision over the most challenging surfaces including smooth, glossy surfaces (except glass) that are problematic for standard optical mice. Ergonomic design and soft rubber grips conform to your hand to be naturally comfortable. Compact size makes it easy to take with you wherever you use your computer. Tiny, unifying nano-receiver connects up to six compatible devices and uses advanced 2.4 GHz wireless. To help prolong battery life, the Smart sleep mode and an On/Off switch save power while an indicator light eliminates surprises.